Where did the name Panoply come from? The word Panoply (pa-nə-plē) comes from the Greek panoplia and means “a magnificent or impressive array”. When is the Panoply Arts Festival? Day passes are $10, Weekend passes are only $18 (available only in advance). You can get your tickets in advance here. Kids 12 and Under get in FREE. 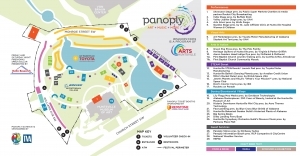 Where is the Panoply Arts Festival held? Downtown Huntsville, Alabama in Big Spring International Park. All ticket sales are final at the end of the purchase transaction and there are no refunds or exchanges. 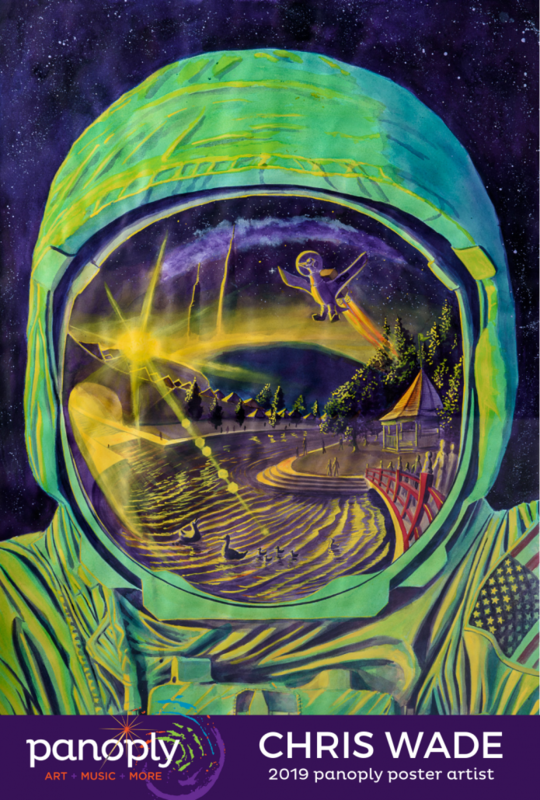 Parking for the Panoply Arts Festival is available at numerous locations easily accessible to Huntsville’s Big Spring International Park. The City of Huntsville will open garages and lots around Big Spring Park for Panoply, striving to make the parking convenient to festival gates. 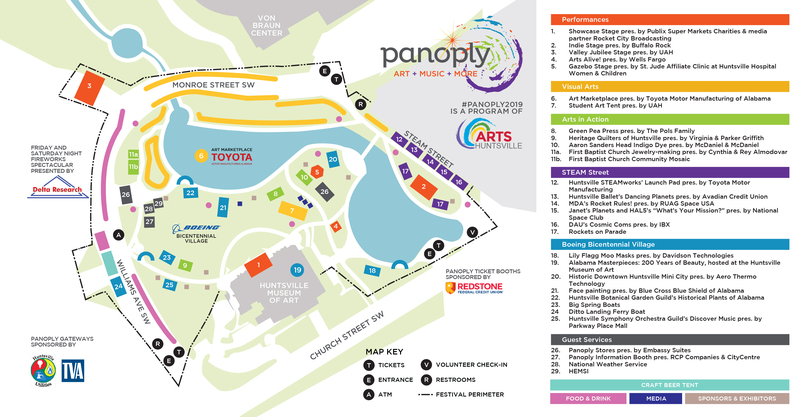 Specific City facilities open for Panoply will be Garage M with entrances on Monroe Street as well as Church Street and Garage B on Fountain Circle. Lot V on Clinton Avenue west of the VBC and Lot K across from the Clinton Avenue Post office will be open for overflow. All City parking facilities will be staffed and have a fee of $5, and credit and debit cards will be accepted. The public is asked to use caution when parking in an unstaffed lot; private property owners can have vehicles towed. If a City lot is not staffed it is designated for another use and parking citations may be issued in that facility. Click here to see the weekend’s parking schedule and use interactive maps and street views for a better parking experience. All of the parking mentioned above is within walking distance of the Panoply Arts Festival in Big Spring International Park. Many other surrounding businesses will also open their parking lots for Panoply Arts Festival guests. Do I need to bring anything to the Festival/What should I leave at home? Bring your favorite outdoor seating; both folding/camping chairs and blankets are permissible. Food and beverages are available through our many and varied vendors, and coolers and outside food and beverages are not allowed. Strollers or small wagons are helpful for small children. You may want to bring sunscreen or a hat, and there are many opportunities to find shade in the Park. Please note that no pets or animals are permitted at the festival, with the exception of service animals accompanying handicapped individuals. Does the Panoply Arts Festival need volunteers? Panoply is wonderful opportunity to give back to the community and you, along with your fellow coworkers, club members, church friends, neighbors, families, and more are welcome to contact the festival Chairmen or Arts Huntsville staff to sign up to volunteer. Shorter volunteer shifts at the festival are also available, and you can signup for those by clicking here to submit a Volunteer Application. For more information, please email info@artshuntsville.org.